Much is made of the pairing of food with wine or beer. There’s nothing like a hearty Cab with a thick cut steak. It’s a smooth Guiness that best foils the crisped fat of a hamburger. And though there are volumes written about which white wine plays best with curried chicken, there seems to be little written about the pairing of beverages with certain events. Beer and wine—they’re stage setters. Each sets a particular tone, whether casual or formal, romantic or festive. And in the same way one would not sing “God Bless America, ” on Christmas Eve, there are particular events which seem to implicitly exclude the serving of either beer or wine. Allow me to bolster this near-absolute with a bit of a multiple choice quiz. d) Either a or c (and if you are ambitious, both a and c). It’s true, isn’t it? Wine and beer lend themselves to different kinds of occasions, pair differently with different moments. That brings us to today’s poetry prompt. Can you pen a found poem about the perfect wine or beer event? Draw from past experiences, or create the poetic experience from whole cloth. Whatever you do, though, convince us of the merits of your event/beverage pairing. And, in case you were wondering, the appropriate answer for each question above is d. It would take some strong rhetorical skills to convince me otherwise. This month’s found poem theme at Tweetspeak is Beer and Wine, and we’re using words and phrases from beer and wine related products, articles, or musings as the prompt. We’d love you to join with is. How do you participate? 1. Grab a cold one or a bottle of wine, a magazine article relating to beer or wine, or your favorite short story touching on the subject. 2. Arrange a found poem containing words from the products. Make sure your poems touch on themes of beer or wine. 3. Tweet your poems to us. Add a #TSCheers hashtag so we can find it and maybe share it with the world. 5. Each week we’ll share a few of the poems. At the end of the month, we’ll choose a winning poem and ask the winner to record his or her poem to be featured in one of our upcoming Weekly Top 10 Poetic Picks. its way into Missouri clay, but it does. of cigar? Down my throat? and turn my eyes to the sun. Thanks, Glynn! And thanks to all of you who participated. I hope you’ll join in again this week! Now, let’s brew some creativity and see what we can uncork! Who’s first? Buy a year of Every Day Poems, just $2.99 — Read a poem a day, become a better poet. In October we’re exploring the theme Wine and Beer. 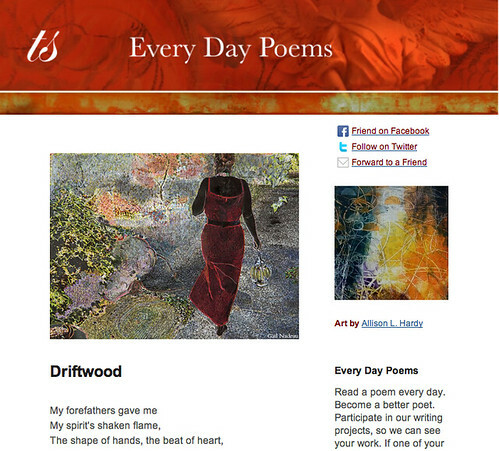 Seth – thanks for featuring my poem! Perhaps I have a future as a wine poet. takes time to get just right. and breathe through the first course. edges with Muscadet’s tart citrus. musky, earthy depths of black truffles. against your simplest chicken roast. to the finish together takes your breath away. haha … great post! Love the homework!